The foundation date cannot be verified but it is generally accepted that Jerpoint was founded between 1163 and 1165 by Donal MacGillapatrick I, King of Ossory. Romanesque architecture in the eastern arm of the abbey church also favours this date. However, Jerpoint was not officially recognised as part of the Cistercian Order until 1180, when it was made a daughter house of Baltinglass. There is some debate surrounding the abbey’s history before this date, some believe the community was Benedictine others say that the monks had been Cistercian from the time of the foundation. The abbey was situated beside the river Eoir or Arrigle, not far from its confluence with the Nore. The Latin name of the abbey, ‘Jeripons’, apparently refers to the bridge over the river Eoir. The construction of the stone church was begun not long after the initial settlement and finished c. 1200-1210. Jerpoint had two daughter houses, Killenny (1162-5) and Kilcooly (1184). In 1217 the Cistercian General Chapter organised a general visitation of Ireland in order to investigate disturbing reports about the conduct of some their Irish brethren. When the visitor arrived at Jerpoint he was greeted with a riot, in which four other abbeys were involved. The abbot of Jerpoint was held responsible and soon after deposed. In 1227 Jerpoint was made subject to Fountains and in 1228 Stephen of Lexington deprived Abbot Brendan of his title and ordered him to go to Fountains for two years. After Stephen of Lexington visited Jerpoint in 1228 he drew up a long list of rules and regulations to be carefully followed by the Cistercian monks of Ireland. Stephen was clearly unimpressed with what he had found at Jerpoint: too much idle chatter, eating and drinking, too much concern for personal belongings and too much contact with outside world. Specific information concerning building regulations was also amongst the criticism directed at Jerpoint (and Duiske). At the time of Stephen’s visitations the number of religious at Jerpoint was fixed at thirty-six monks and fifty lay-brothers. The abbots of Jerpoint sat as peers in parliament. By end of the thirteenth century Jerpoint was heavily in debt to Italian merchants as a result of the practice of forward buying (receiving payment in advance of production, in this instance of wool). In 1289 the monks owed the firm of Bendinus Pannyth of Lucca almost £430. In 1374 Jerpoint complained to the bishop of Ossory that it was so impoverished by war between the Irish and the English in the region that it could not fulfill its obligations of hospitality. In 1442 the abbey was granted an indulgence for the repair of the cloister, dormitory, bell-tower, other offices and the chapel of St. Moling. However, in relative terms the abbey was not as hard up as it seemed. At the time of the Dissolution the annual income of the abbey was valued at £87, making Jerpoint one of the richest Cistercian abbeys in Ireland, and comparable in value with the smaller Cistercian monasteries in England. In 1539 the Lord Deputy proposed that the monastery should continue, the monks changing into a secular habit and the monastery serving as a house of hospitality. It seems the proposal was dismissed and the abbey was surrendered by the last abbot, Oliver (Grace), in 1540. In 1541 the royal commissioners reported that the roof of the chancel had already been thrown and that the nave had served as a parish church for some time prior to the Dissolution. The commissioners also ordered that the cloister, dormitory and adjoining buildings should be demolished, and the others left for the local farmer. Following the Dissolution the property was granted to James Butler, Earl of Ormond. 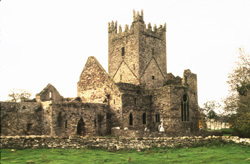 In the early years of the nineteenth century the Cistercian ruins of Ireland became popular with the romantics. In 1823 the ruins of Jerpoint abbey inspired a nostalgic poem entitled: ‘Lines Written at Jerpoint Abbey’. Today there are extensive ruins including the church (c 1160-1200) and an imposing crossing tower added in the fifteenth century. The six bay nave has alternating square and cylindrical piers, following the design at Baltinglass, although this design was abandoned in the final two bays in favour of octagonal piers. This was probably the result of a lengthy and disjointed period of construction. The sacristy, chapter house and parlour also remain but the south and west ranges are far more fragmentary. The cloister arcade was reconstructed in 1953. The capitals are decorated with human faces, animals, grotesque beasts and flowers. There is even a carving of a man with stomach ache. The sculpted images belong to ‘the common stock of motifs used by Gothic craftsmen throughout the British Isles’, and it is thought that the statues date from c. 1400. The church also contains a selection of tombs and grave slabs, including two fine effigies of ecclesiasts. The tomb of Bishop O’Dulany (d. 1202) lies in the church transept. On the chancel are faded wall paintings depicting stylized portraits of saints. The site, two kilometres south of Thomastown, has been in the care of the Office of Public Works since 1880. The ruins can be accessed by the public at all times.